Shocked about how much nicer the hotel bathroom was than the typical Cuban bathroom. 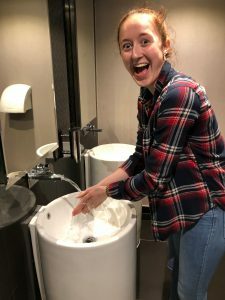 We could flush toilet paper! In more ways than one, living in Cuba can feel like you are living in the past. Due to the fact that they were effectively cut off from the rest of the modern world, Cuba lacks a lot of modern technology and advancements. However, this is not true throughout the entire island. 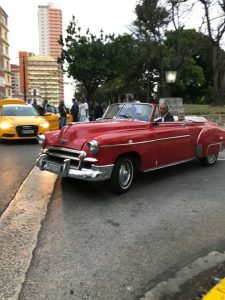 The life of the average Cuban includes little to no modern technology, including internet, but there are a few select hotels that, upon entering, make you feel like you have entered an entirely different world. That stark difference is unlike anything that exists in America. Just imagine taking a five star hotel from New York City and dropping it into a lower income area. No one that actually lived in that location could stay there because of how far out of their budget it would be. To make things even more extreme, imagine that the people living around that hotel can’t even flush their toilet paper due to sewage problems, and that they have no internet, Wifi, and limited resources such as towels and food. But, of course, any five star hotel allots about four towels per guest, has perfectly good plumbing, free Wifi, and a large selection of food to choose from. Doesn’t it just seem inhumane that the guests of this hotel were living lavish while those directly around them existed in such different conditions? That would cause a social class outrage in the United States. But in Havana, this scenario is very real. Walking around Cuba, you could tell from much of the infrastructure that it was dated. The modern world has kept advancing and definitely left Cuba behind. 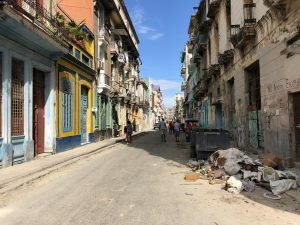 As mentioned, Cuba lacks many resources including consistent food sources and all the basics that we take for granted, such as shampoo or pillows. They have no internet or Wifi unless you buy a Wifi card. A card gives you 60 minutes of Wifi that you can connect to if you are near a hotspot, which exist sparingly around the island. They also have problems with their plumbing, which is why you must throw your used toilet paper in the trash rather than flush it down the toilet. This is a small thing that makes a huge difference as opposed to the comforts of the modern world. If you’re craving a snack, you can’t go to a convenience store to grab one because they don’t really exist. Pharmacies are difficult to access and may leave you waiting in line for hours. And, of course, the cars include many old models that Cuba is famous for. What was most jarring for me as a foreigner was the quality of the water. Tourists and visitors cannot drink the water or ingest food washed with non-purified water without getting sick. Even some Cubans won’t drink the water, relying on water bottles or boiling their water to sanitize it before use. We all had to be extremely careful not to swallow any water while showering, and had to use bottled water or purified water to brush our teeth. And believe me, it’s so easy to forget you can’t brush your teeth with sink water because of how much of a habit it is. This is less of an issue that Cuba itself holds since many places around the world have water undrinkable for foreigners due to its bacterial makeup, but it was still an odd concept to wrap my head around. I definitely felt as if I was living in the past while I was in Cuba. The infrastructure that made it seem so dated had been due to the embargo and it’s crippling effects on Cuba as a whole. However, everywhere we went, we saw progress being made to improve the crumbling infrastructure. I sincerely hope they continue to slowly but surely revamp the country so that its infrastructure mirrors the progress the people have made in these recent years.